Falmouth has come along way since 1600 when it only consisted of two houses, a smithy and an alehouse, but when Sir Walter Raleigh stayed with Sir John Killegrew at Arwenack House, he was so impressed with its geographical features that he recommended that the site should be developed as a port. Sir John gained Parliamentary approval to develop the site and within a few years the village started to grow. Originally known as Smithwick or Smithick it later became known as Pen-y-come-quick ("the head of the narrow vale"). In 1660 a Royal proclamation changed the name to Falmouth. For nearly 300 years Falmouth remained one of the principle ports of the world, where during the mid eighteen hundreds it was not an uncommon site to see 350 ocean-going sailing ships at anchor in the "Carrick Roads" at any one time. 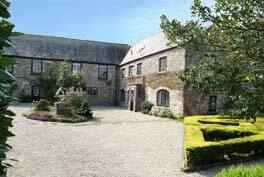 As Falmouth developed during the seventeenth century, the oldest building that it can boast is the Elizabethan manor of the Killegrew's at Arwenack House. However, much of this was destroyed during the Civil War, and what remained was incorporated into the replacement building built in 1786. The parish church of King Charles the Martyr was built between 1662-64, while off the main streets some of the original 17th and 18th century cottages may still be seen. Self-catering Holiday Apartment Rental in Falmouth with Sea Views- sleeps 4.